Think of the top five architectural gems in New York City and the Flatiron Building has to rank right up there with the epic tallness of the Empire State Building, the shimmering symbol of a new era that is the art deco Chrysler Building, or the mid-century modern structure made perfect in the Seagram Building. The Flatiron's 21 stories serve as a touchstone; it defines the New York City of another era and today gives midtown Manhattan a reason to ease up on the hustle a bit and take a look in wonder. Yet, the Flatiron Building, this iconic symbol of the city that is the center of the universe, is, literally from top to bottom, a Chicago skyscraper. 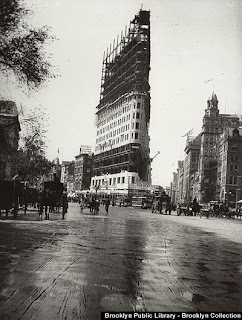 In the first blog on the Flatiron I talked about the fact that the George A. Fuller Construction Company, based in Chicago, looked to erect the building as its headquarters. So from the very beginning the Flatiron had a Chicago connection. Probably more important than Fuller's connection, though, was the connection of the great Daniel Burnham's Chicago architectural firm. By 1902, Burnham had already led the planning and construction of the greatest exposition the world had ever known, the 1893 World's Columbian Exposition in Chicago. His firm had designed buildings from Buffalo to Baltimore and from Chicago to Columbus. By the time planning began for the Flatiron Building, Burnham's firm had designed Chicago buildings that still stand in splendor, among them The Rookery, The Monadnock and the Reliance Building. In January of 1902 the commission that Burnham led presented the McMillan Plan to the Senate Park Commission, a plan that would set a precedent for urban planning in the United States and reinvigorate the center of the nation's capital. So it was logical that Fuller, the Chicago construction giant, would choose Burnham, the architectural giant, to plan its new headquarters in Manhattan. Burnham put Frederick Dinkelberg in charge of the project. 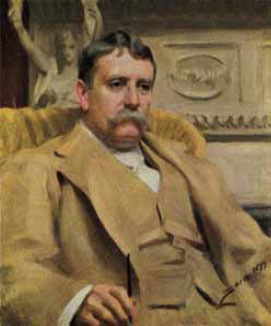 Dinkelberg had served as an assistant to another great Burnham designer, Charles Atwood, and had just finished work on the plan for the nation's capital. Dinkelberg's genius can be found not just in the Flatiron Building's plan but in other great buildings such as 35 East Wacker,the Santa Fe and the Heyworth buildings in Chicago. Together, Dinkelberg and Burnham brought the Chicago skyscraper to Manhattan. Although not the tallest skyscraper in New York at the time (the Park Row building of 1899, located in the city's financial district was 30 stories tall), it still was tall enough to be called "Burnham's Folly" by folks who thought the wind would surely topple a building of its height. 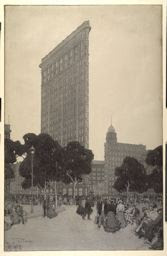 Here was the tall commercial office building erected around a metal skeleton composed of 3,800 tons of steel, the metal framed skyscraper that Chicago architects such as William LeBaron Jenney, Daniel Burnham, William Holabird and Martin Roche had created, perfected and given to the world. Here was the tripartite construction that typified nearly all of Chicago's early tall commercial buildings -- the reference to the column of classicism -- a design that created a base that was wider than the shaft of the Flatiron that rose for 18 stories or so, topped by the ornate exterior of the upper floors. Here was the engineering expertise that had caused Chicago buildings to rise ever higher. Corydon Purdy, the engineer on Holabird & Roche's Old Colony building of 1894, the first building to use portal arches to join columns and girders for wind-bracing, was also the engineer on the Flatiron building. Here, too, was the Beaux Arts style, the common idiom adopted by the architects Daniel Burnham, as Head of Works for the 1893 World's Columbian Exposition, had gathered together from Chicago, Philadelphia, Boston and New York City. The style took the unities of classicism and, sometimes crudely, sometimes beautifully, hung them on the metal frames of ever higher buildings. Since classical design was essentially horizontal and these new tall buildings clearly vertical, successfully combining the two was an arduous process. But the best of the early commercial buildings in Chicago make the cut as does Dinkelberg's and Burnham's Flatiron. Here, too, was the terra cotta exterior that adorned so many of Chicago's early commercial buildings. And the bays running up the wide sides of the Flatiron that allowed developers to use the air over the sidewalk to grab additional space for office interiors, while admitting 15 to 20 percent more light to the interiors of those offices. The Flatiron building's bays have the same subtlety and the same organic unity that John Root's Monadnock building in Chicago were given over a decade earlier. More than anything, though, here was a building, like the best of the early Chicago skyscrapers, that were functional AND beautiful. Situated on a difficult lot, the Flatiron nevertheless has 183,449 square feet of office space, room for over 600 workers. But the beauty of the building is what strikes one first. 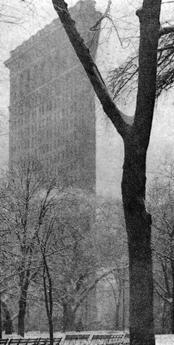 As author Alice Sparberg Alexiou, whose The Flatiron: The New York Landmark and the Incomparable City That Arose with It was published last year, wrote, "The Flatiron has always obsessed people. And I think it always will . . . Maybe it has something to do with the fact that it's a triangle. Triangles are magical. There's something almost religious about them." So when the cold weather lifts, have some fun. Walk down to Van Buren and Dearborn and have a look at the cornice at the top of Holabird & Roche's cleaned up Old Colony Building. Then walk north on Dearborn to Wacker and look east toward Frederick Dinkelberg's 1926 terra cotta extravaganza at 35 East Wacker. You'll see how easily New York City's Flatiron building could fit into this toddling town on the prairie. Enjoyed the history lesson and the video in front of the building is really special. Nice touch!